The further north you go, the nicer people are. 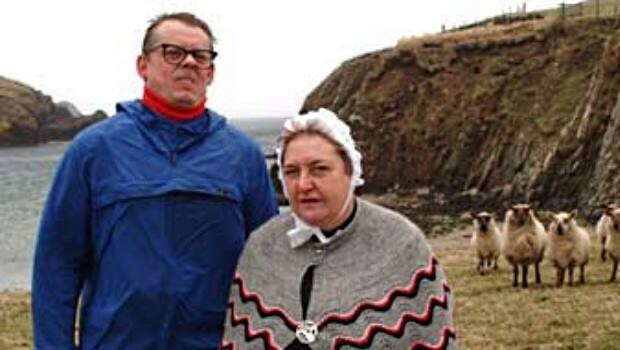 That was John Shuttleworth’s theory and he sought to prove it by shooting a documentary in the Shetland Islands. Having roped in renowned stills photographer Martin Parr as his cameraman and jumped in his trusty Austin Ambassador, Sheffield’s overlooked pop sensation hopped on the ferry and began his quest, meeting locals and spending nearly an hour queuing in the UK’s most northerly Post Office. The result, It’s Nice Up North, is an intriguing sociological study of a slightly odd man being indulged by an entire community. Shuttleworth is, of course, the creation of comedian Graham Fellows and the film is a spoof travelogue, though this appears to have been lost on the Edinburgh Film Festival. They declined to include it in this year’s line-up, having classified it “curatorially as a documentary in consideration of the actual content and style. “I think they kind of missed the point,” grumbles Fellows. “We put it into consideration as a feature film and they came back saying there were only 20 slots in the documentary section.”It’s to Fellows credit as an actor that this confusion might arise and the film will be screening in Edinburgh anyway. Shuttleworth’s current tour, Fawn Again, which arrives in the Pleasance Courtyard during the Fringe, is already showing a ten minute trailer. And a full premiere is booked for the Assembly Rooms on August 14. A special screening in the Shetland Islands is also pencilled in for October. A regular fixture on Radio 4 and a sometime support act for both Blur and Belle and Sebastian, 46-year-old Fellows is now the same age as Shuttleworth was when he created him over twenty years ago. In the late 70s, Fellows had enjoyed fleeting fame as Jilted John with the hit single Gordon Is a Moron and went on to appear in Coronation Street as two different characters. But it’s as the dufferish, retired security guard whose songs celebrate the dilemma of returning to shepherd’s pie after pudding that he remains best known. Though not, it seems, in Shetland. His affection for the area is likewise relatively fresh. “I’d done a show at the theatre there in the summer of 2003. I’d taken the family up, had a bit of a holiday and fallen in love with the place really. On the most northerly island there’s a bus shelter with a sofa, a TV and a stuffed parrot. People had put all this junk there as a joke to make it a cosy little place to be while waiting for the bus and I realised that if this had been mainland Britain the stuff would have been trashed. Yet it had been there for four years and I just thought it was symbolic of niceness. Roaming all over the islands and stopping to chat, Shuttleworth soon found friendliness was linked to latitude. “We weren’t after any specific responses,” says Fellows, explaining that although John’s visits to specific places were planned, the responses captured were not. “As to whether they were nicer or not there was no agenda – it was simply what we found. They were just very nice. “Everyone was filmed without permission; we were just sticking a camera in their face and having John chat to them. And every single person without exception signed the consent form. My experience of filming in London and England is that people often withhold those forms. “Of course, there’s no crime in Shetland. The first time I went I was amazed when the woman from the car hire company said just leave the car in the car park unlocked, put the keys behind the visor. Parr too, was amazed by the local selflessness he witnessed. “There was this guy who genuinely wanted to fix John’s car for free,” he recalls incredulously. Ironically though, given the film’s subject matter, the pair soon developed “creative differences”. “We really didn’t know that John and Martin would end up falling out,” says Fellows. ”But that’s what happened. The nicer people got, the nastier John and Martin became. Fellows must now return to Shetland for the screening and to pick up the Ambassador, which was left behind for repairs. So I ask him if he could live there permanently. He laughs. And could John ever decamp from his beloved Sheffield?